Church Direct Mail Services from Outreach, Inc. Your report request has been submitted! We'll contact you soon. 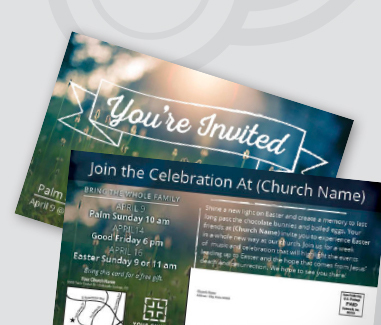 In addition to gorgeous, impactful designs and high-quality printing, Outreach can help you deliver your direct mail postcards to the right people, in the most optimal way — ensuring you get the best results and are a good steward of your church's resources. 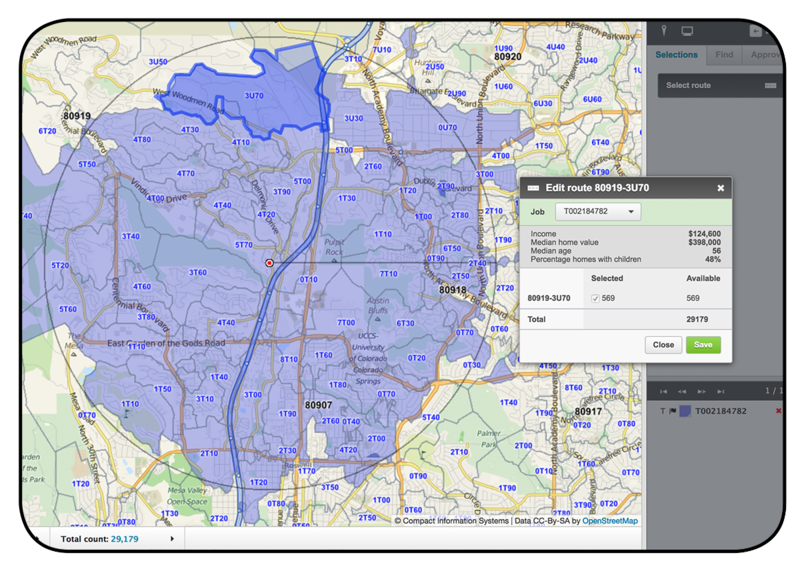 Get a FREE OnTarget Demographic Report, this snapshot provides you with basic demographic information within the postal carrier routes around your chosen address. 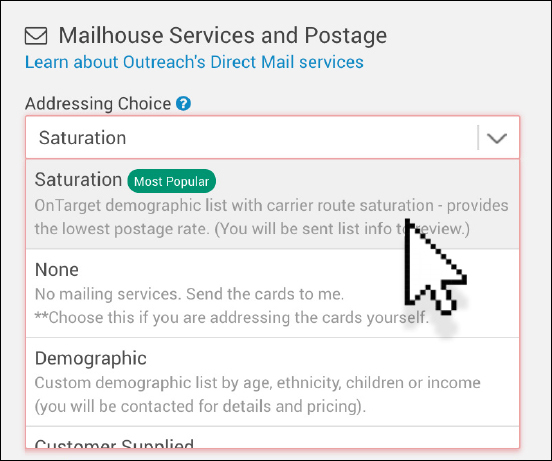 With OnTarget you can choose the best areas to send your postcards and save money by not mailing into areas that are less responsive. By using complete carrier routes and "saturating" your community with postcards, you will pay less in postage, only 8.9 cents! This postal rate is dependent on having a non-profit postal authorization from the post office - Outreach will help you apply for this authorization if you don't have it—FREE! (Please allow extra time for this application process) You do not need to purchase a bulk mail permit to get the low saturation postal rate. Outreach will guarantee your postcard mailing arrives in time for your event. Your cards are designed, printed, addressed and shipped directly to the Post Office so they can be on the way to homes in your community fast. 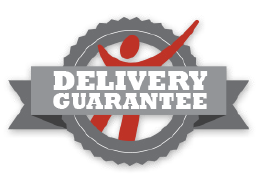 You can choose your in-home delivery date when you order. Your cards are designed, printed, addressed and shipped to your church in mail trays with the proper postal paperwork. Then you can deliver them to the Post Office. Send your postcards to a more targeted list. 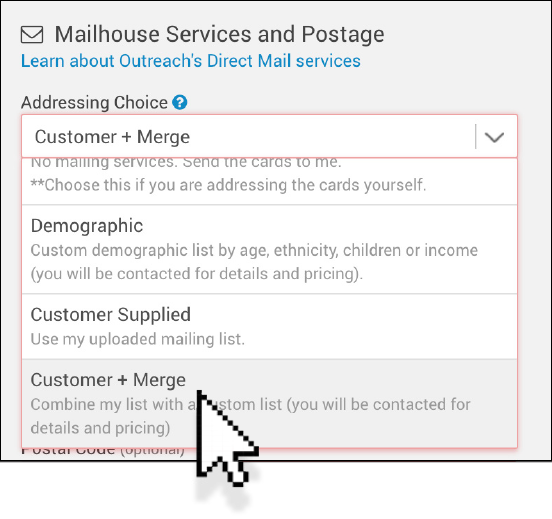 Outreach can provide you with very specific demographic lists so you can target the people who are usually more likely to respond to your message, thus maximizing your effectiveness. A good example is a postcard promoting a summer VBS program - you may want to only send the cards to households with children who are a certain age - and not to people who have no children in the home. Outreach can help you with this mailing service provided by the US Postal Service. 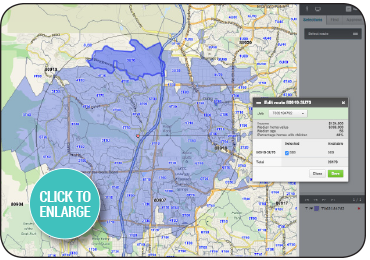 EDDM service is restricted to certain sized postcards and works best with the extra large 11" x 5.5" Outreach postcards. 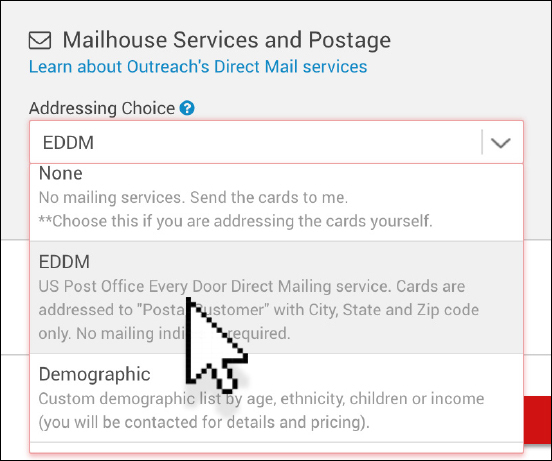 Outreach prints the postcards and addresses them according to EDDM standards, with "Postal Customer" as the recipients name on the cards. Once printed, the postcards are delivered to your church, and you will need to bundle them in packs of 50s, add facing slips on the bundles and deliver to your local post office where you pay for the postage. There are times you may want to send a special event promotion to everyone in your database. With Outreach postcards, you can supply us with your own "house list" for a mailing. Once you place your order, our Outreach Specialist will contact you with details on how to submit your list. 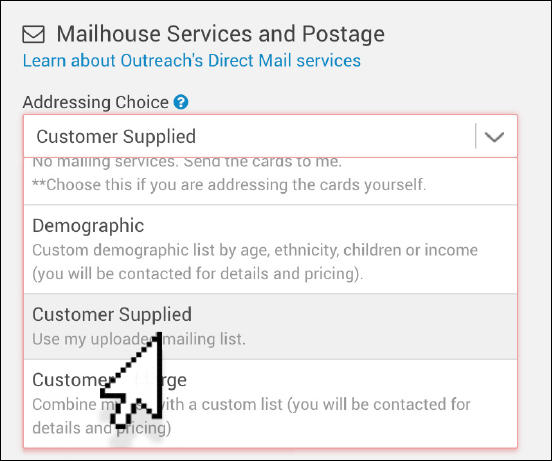 If you are doing a mailing into the community but also want to include your own house database of names, this option accommodates both lists. 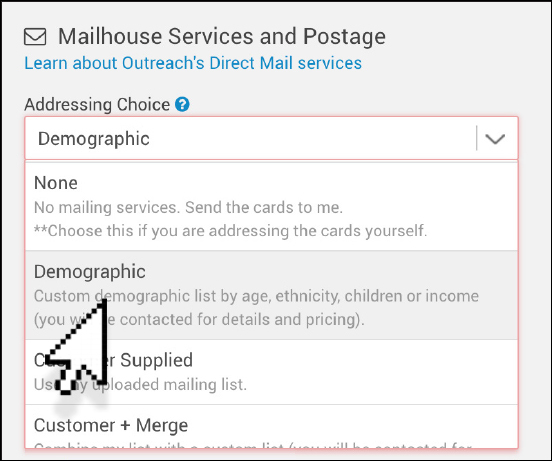 We merge your house list with a saturation or demographic list, remove the duplicates and deliver your cards. Ready To Choose A Postcard Design?